With many health facilities damaged or destroyed in typhoon-affected Mindanao, experts have expressed concern about the state of maternal health care. “Many village health centres were totally destroyed. Even in those centres that were only partially damaged, medical supplies were washed or blown away by the winds,” Ugochi Daniels, country representative from the UN Population Fund (UNFPA), told IRIN. Government estimates put damage to the region’s healthcare facilities and infrastructure at more than US$12.5 million. According to the Department of Health (DOH), 146 of the affected region’s 369 village health centres sustained varying degrees of structural damage, and all four government hospitals were damaged. “The implementation of public health programmes is really in the village health centres and midwives are the frontline healthcare providers. With the damage to these centres, the [pregnant] women don’t know where to go, or have to go very far. The midwives have no place to administer [to] patients,” said Joy Sanico Davao, a senior official at Davao Oriental Provincial Hospital. 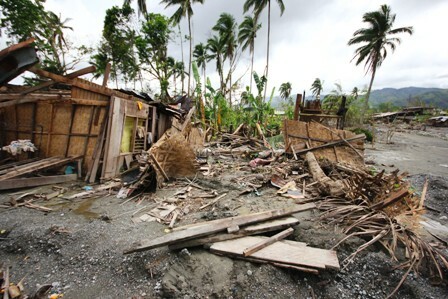 Typhoon Bopha (local name Pablo) hit the southern island of Mindanao on 4 December 2012. More than 6.3 million people were affected, with an estimated 2,000 dead or missing. More than 200,000 homes were damaged or destroyed, according to the National Disaster Risk Reduction and Management Council (NDRRMC). UNFPA estimates there are 8,356 pregnant women in typhoon-affected areas in need of antenatal care, many of whom are not getting it. Of these, an estimated 2,785 are in their last trimester. “In particular, there is an urgent need for provision of pre-natal, post-natal check-up and supply of dignity kits for pregnant and lactating women, with special consideration for teenage mothers in affected communities,” the UN Office for the Coordination of Humanitarian Affairs (OCHA) reported on 8 January. Antenatal checkups are crucial in the early detection of pregnancy complications, say experts. Studies show that adequate antenatal care can reduce the incidence of maternal death and miscarriage among mothers, as well as birth defects and low birth weight among newborns. DOH recommends a minimum of four antenatal visits during each pregnancy. Local government officials and aid agencies are going around different villages on medical missions to track and record pregnant and lactating mothers. Kits which assist emergency delivery are being distributed to midwives. In Mindanao’s Davao Oriental Province, figures shown to IRIN by local health officials indicate there are 1,496 pregnant and lactating mothers, 951 of whom have been tended to by medical missions. “We’ve had women walk from as far away as 10km to get to our medical missions. Some even literally cross rivers,” said Geofford Montejo, a provincial maternal health and childcare coordinator. “The pregnant ladies also need more psychosocial support. They’re worried about the lack of livelihood opportunities after the storm. They have little or no money and have a baby on the way,” said Esther Yiu, a midwife in the International Committee of the Red Cross (ICRC) rapid deployment unit. ICRC set up a basic health care unit in Davao Oriental to augment urgently needed medical services.